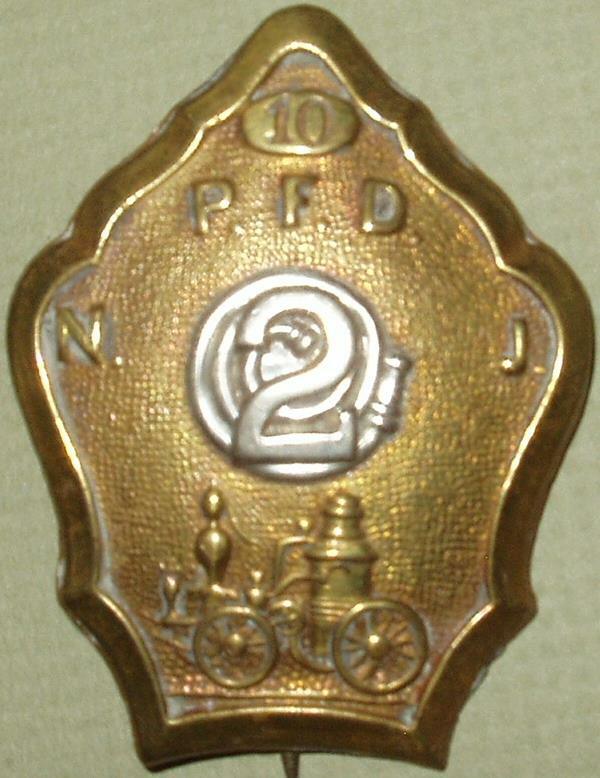 Company Motto was "Onwards and Upwards"
​The company was first quartered in Passaic Engine Company No. l's house at Broadway and Mulberry Street. 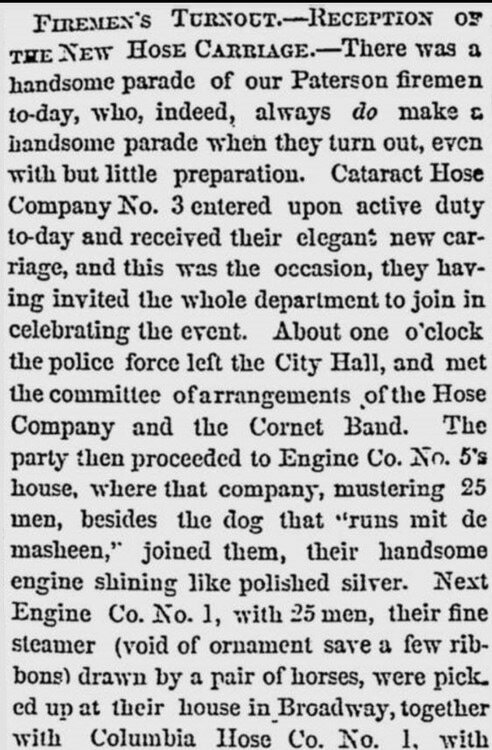 From the 1939 book "Enjine, Enjine"
Cataract Hose Company house and apparatus were burned and destroyed on the night of November 9, 1888. 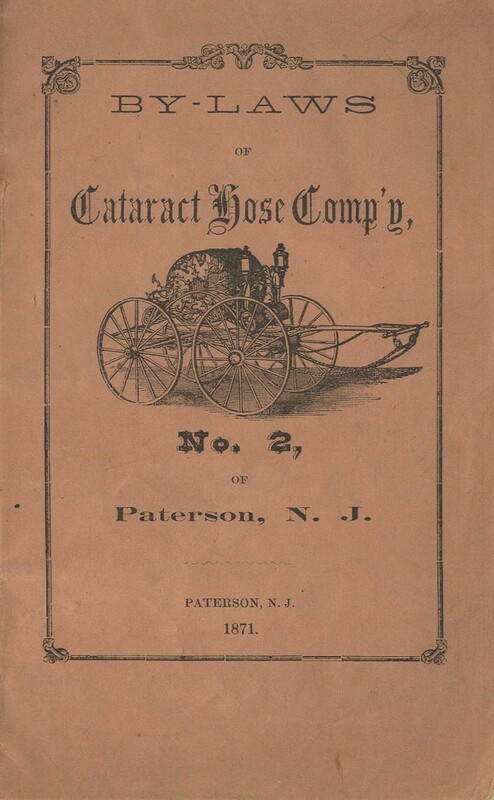 At that time te firehouse was rebuilt and a new Hook and Ladder Company or Truck company (Rapid 3) was organized to replace Cataract 2. 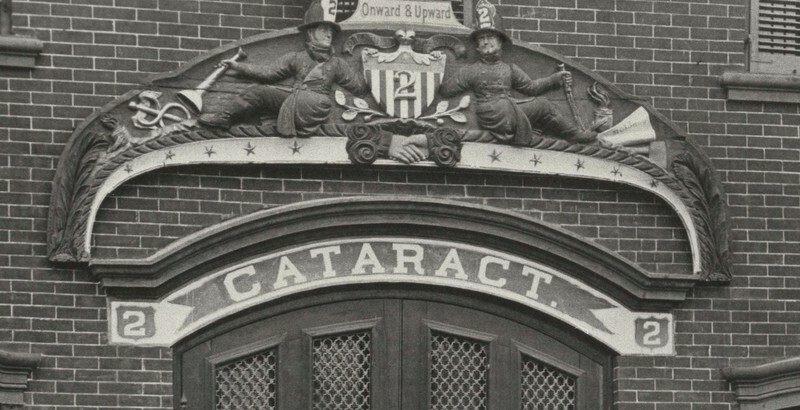 The former members of Cataract 2 formed the new Truck company. 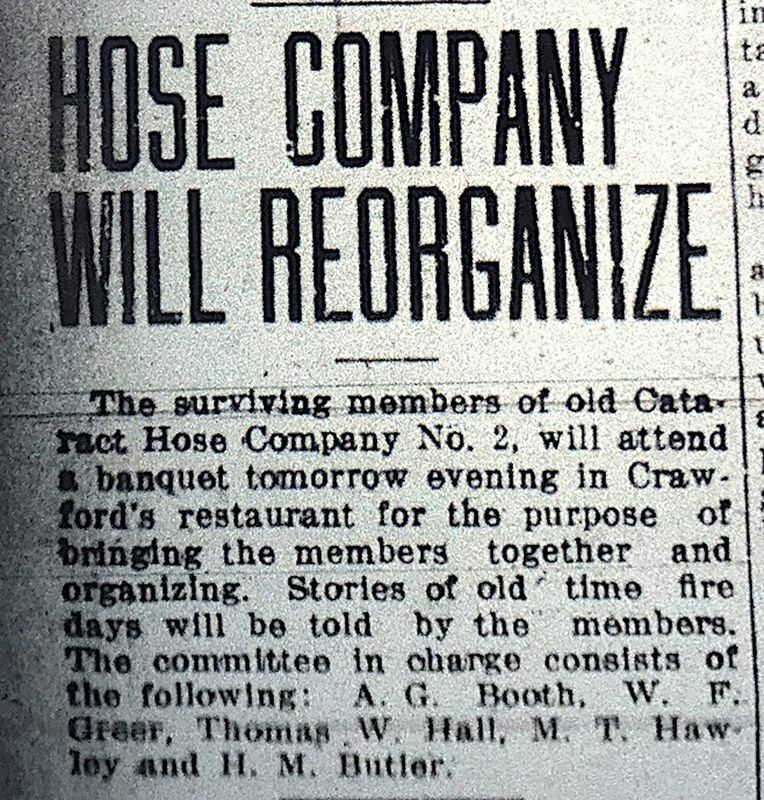 ​The city disbanded all hose companies in 1889 as the paid department was being organized. 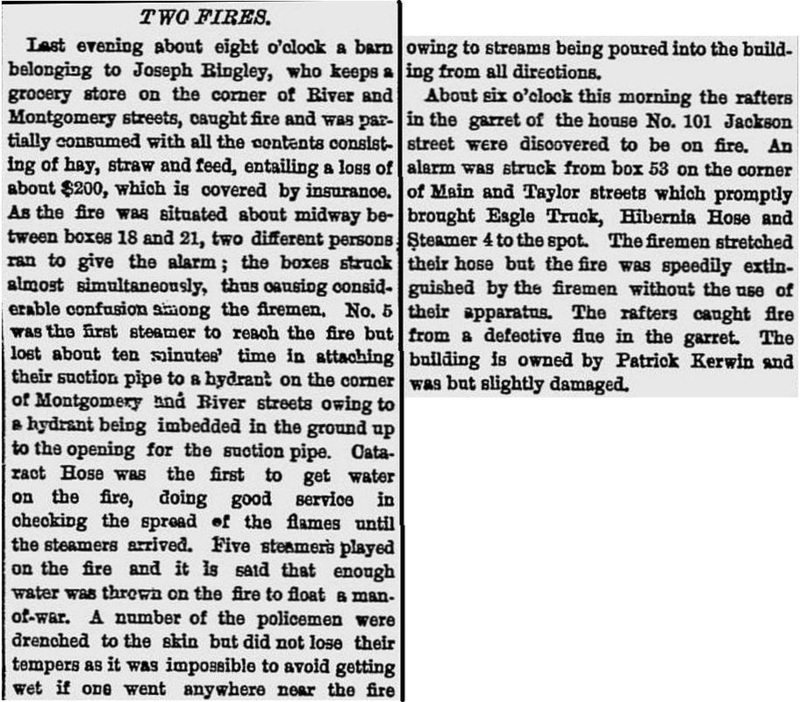 Cataract 2 to the Rescue: Newspaper description of a June 2, 1882 fire. 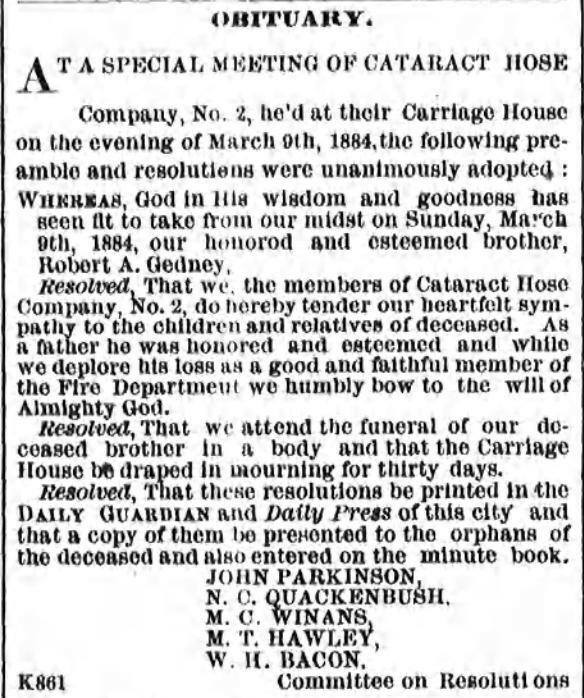 March 9, 1884: Firefighter Robert Gedney of Cataract 2 died responding to Box 21 at Bridge and River Streets whch sounded on a cold and stormy night for a fire in 2 story house. 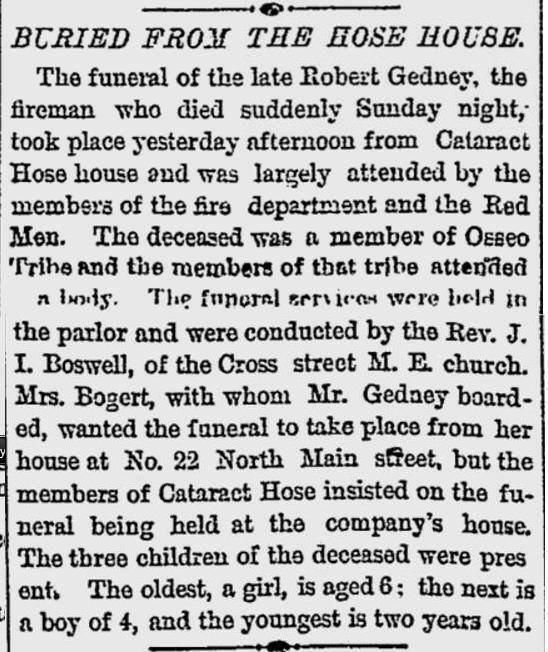 Fireman Robert Gedney responded from his home - running to the scene. 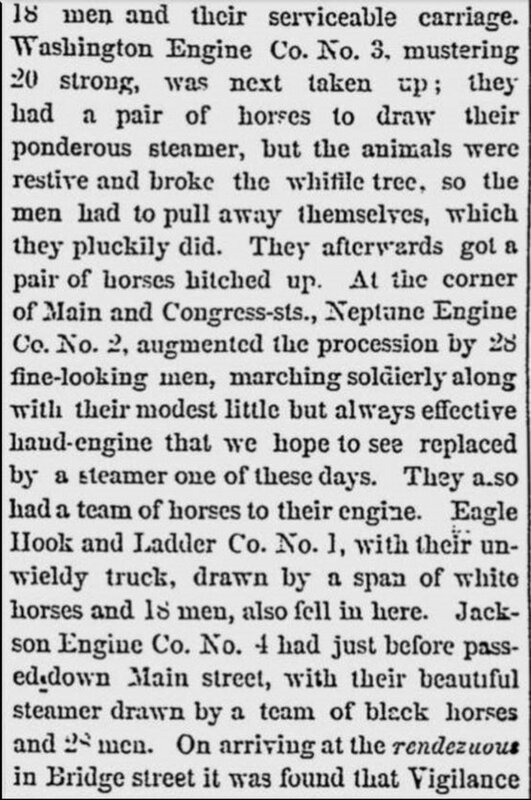 He collapsed on the Arch Street Bridge and died presumably of a heart attack. 1 John Marshall . . . . . . Baker. . .......... .Cor. Jackson & Clay. 4 James Paton. .... ...... Printer... .. ........63 Water street. 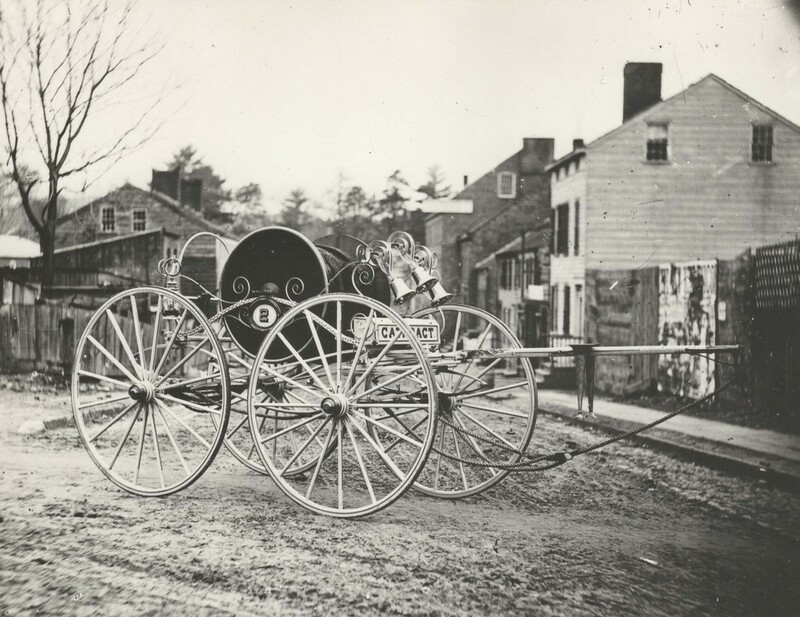 5 James Conlin.......... Teamster.. .........4 Lane street. 6 Cornelius Van Riper.. . .Printer.... .........12 Tyler street. 7 Charles Moss.... . . . .. ..Laborer. .......... 179 Tyler street. 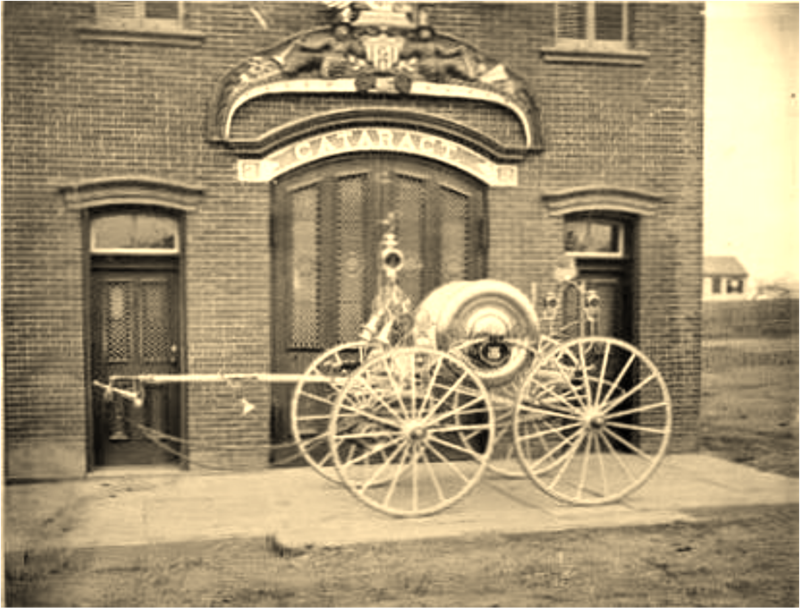 8 William F. Townsend.. .Moulder.. ........ ..Albion Avenue. 9 John Mallinson. . . .. Painter.. . . . . ..... 127 1/2 North street. 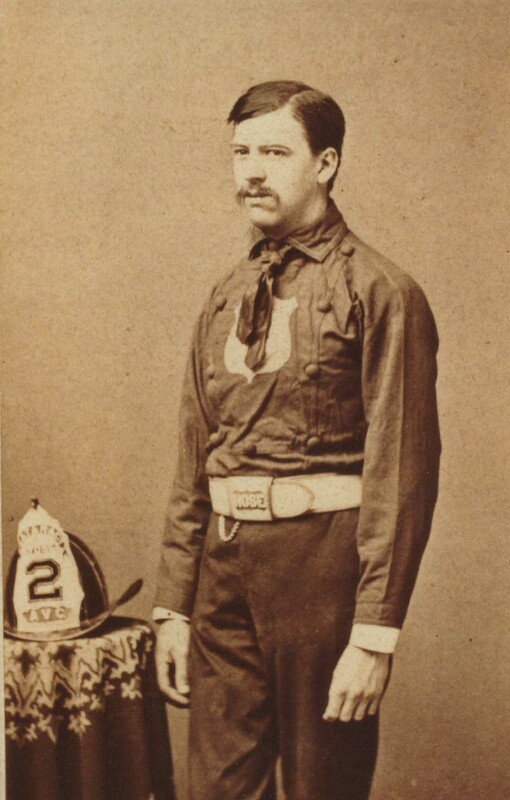 13 James B. Greer... .. .. ..Carpenter. ........ . 36 Fulton street. 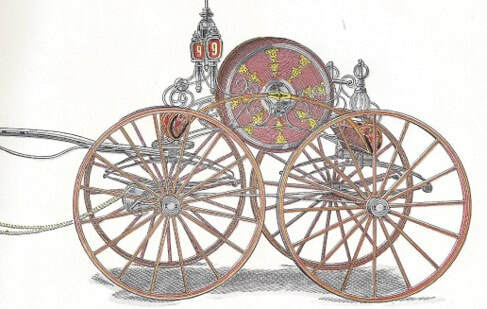 14 John Parkinson. . . .. . ..Brass Finisher. . .. .. 107 Division street. 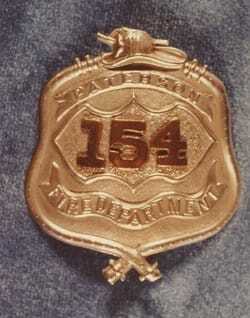 15 James H. Coyle.. .. . ... . .Dyer. ........... ..19 Washington street. 16 Richard Acker. ..... .Laborer. .......... 18 Watson street. 17 Nathan'l Quackenbush.....Carpenter. ....... .186 Mechanic street. 19 Peter Post. . .. . ... . . Silk Weaver. .. .. ........32 Percy street. 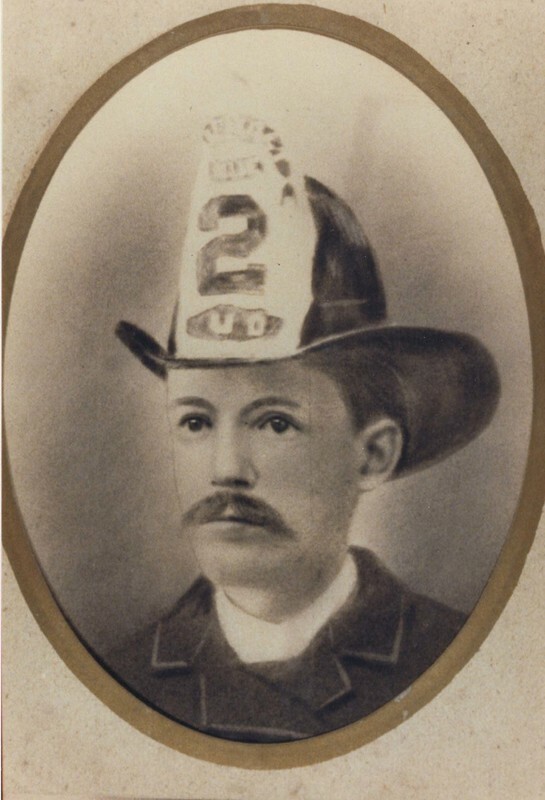 21 James H. Fox. . . .. . . . .Blacksmith. ........41 William street. 24 Robert Dewar. .. . . .. ...Brass Finisher ... 157 Willis street. 25 Phillip Hartley. ....... Carpenter..................1 Arch street. 26 John S. Shaw ...... Carpenter........ . ......22 North Main street. 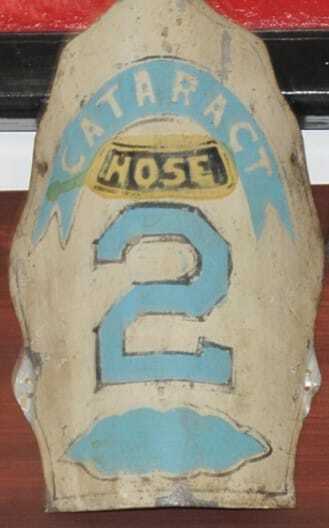 27 David H. Quackenbush......Carpenter . ........11 East Main street. 28 Lemuel Paulison. ...... Brakeman. ..............123 Rip Van Winkle. 29 SyIvester Van Gieson . . . .Grocer ........ 216 Godwin street. 30 Albert G. Booth. . ....Clerk ..........................221 Godwin street. 31 Charles Neeb. . . .. . . . .. .Watchman.......... 275 River street. 33 Nicholas Boogertman . . . Silk Weaver. .... 43 First street. 34 Leonard Brain . . .. . . .. Teamster. ....... .Jefferson & North 4th. 35 Thomas G. Wilson. . .Silk Weaver. ..... 193 Division street . 37 William Close . ... . .. Dyer . ... .. . .. .. 209 Godwin street. 39 John Woodward ...... Liquor Dealer.. . .. .61 River street. 40 Albert Mainz. .......... .File Cutter. ....... 34 Madison street. 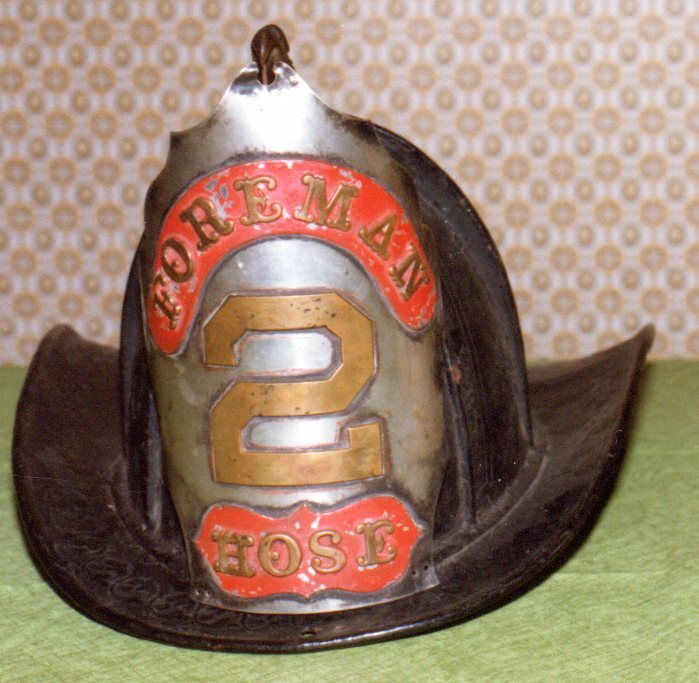 41 Leonard Wienman . .. .File Cutter... . ..34 Madison street. 42 Nelson Norris. ... ..... Machinist. ....... 64 R.R. avenue. 43 Edward Coleman. . . .. . . .Silk Weaver.........94 Paterson street. 44 Charles Green.. . ... .. ..Clerk.. ...... . .. .. .Summer street. 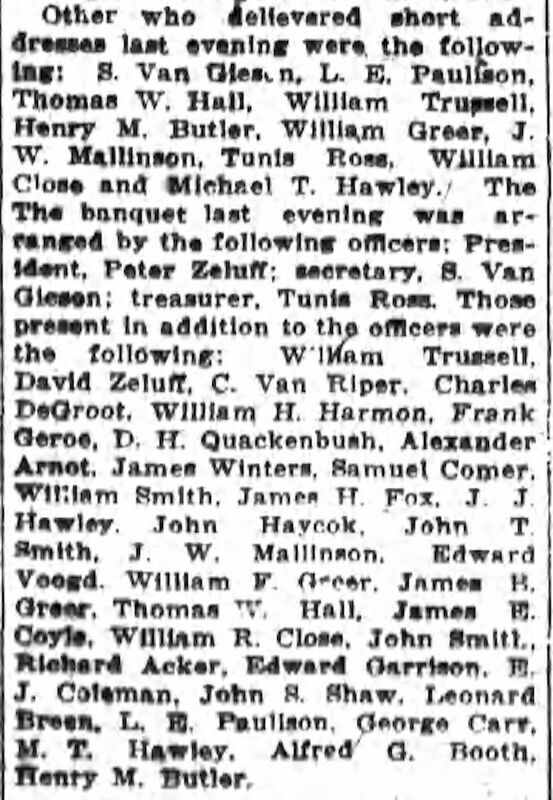 45 William Trussell........ Mason . . .. .. Madison av. & Palton. 46 Matthew C.. Winans.. . . . .Silk Weaver. .......122 Matlock street. 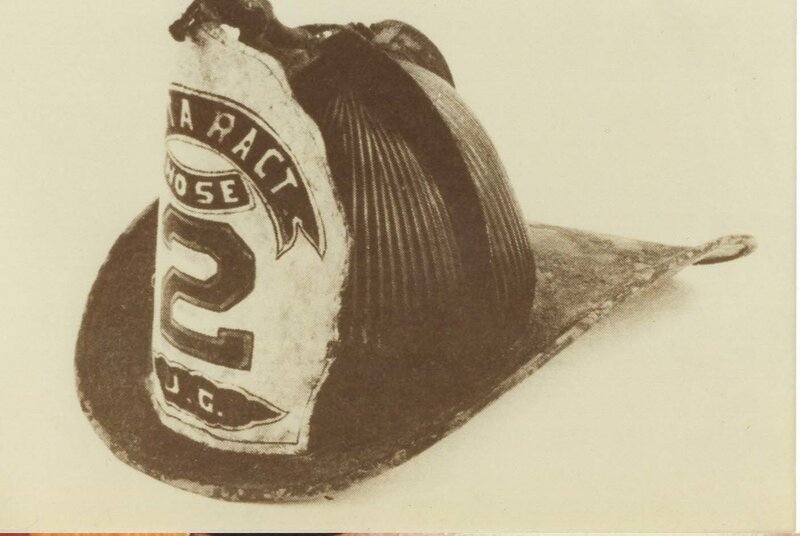 47 William H. Bacon. . .... Machinist ..........11 Cross street. 48 Tunis Ross.. ............ Painter ............88 Lane street. 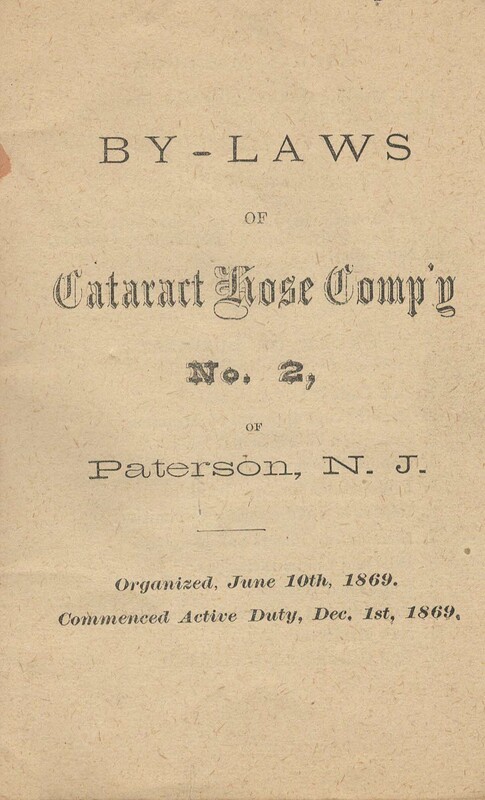 1888: Alderman started the reorganization of the Volunteer Department by closing the three hose companies, including Cataract Hose 2. 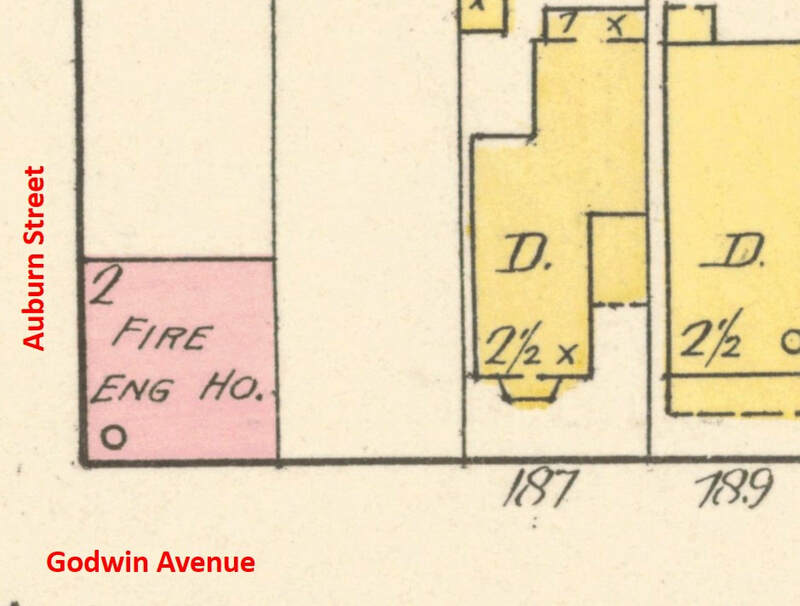 Shortly thereafter the Godwin Avenue firehouse was destroyed by fire.